Point Counter Point - Does leniency for testimony violate federal criminal law? State Bar officials were guardedly optimistic last month that the Supreme Court would grant their petition to order California attorneys to pay $171 each to keep the foundering discipline system afloat. "I'm not a betting man," said President Ray Marshall, "but it's clear the justices understand the issue. I hope the answer is yes." 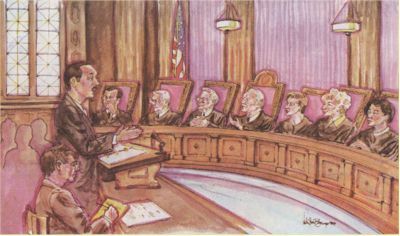 In an unusual hearing Nov. 9, the seven justices heard testimony from 15 speakers on the issues of whether the court has the authority to order a regulatory assessment and whether it should do so. The $171 would be in addition to the $77 annual fee the bar is authorized by statute to collect. Chief Justice Ronald George and Justice Joyce Kennard seemed inclined to favor an interim assessment, perhaps to be overseen by a special master appointed by the court. The justices suggested that such an arrangement would be stopgap in nature and remain in effect only until the legislature acts and some level of funding for the bar is restored. The court did not state how it will rule on the bar's petition or when it might act. Marshall told the court the bar's attorney discipline system has been gutted as a result of Gov. Pete Wilson's October 1997 veto of its dues bill. "We have a crisis situation," he said. "California lawyers stand unregulated." There is now a backlog of nearly 7,000 cases, with another 500 complaints arriving at bar offices every two months. Without any funding, Marshall said, there will be 10,000 uninvestigated cases backed up at the end of 1999. "You are our court of last resort," he said. "Each day of delay is another day of harm." Democratic gains in the legislature and the election of Gray Davis as governor give hope to the beleaguered State Bar that it may win funding after more than a year of frustration and failure in Sacramento. Several members of the bar's board of governors cautioned that money to restore programs probably will not be in the bank before the year 2000. And they acknowledged that bar cannot ignore the barrage of criticism heaped upon it after Gov. Pete Wilson vetoed its dues bill 14 months ago.